Really pretty, light and fun! Those are so fun! I'd love to have a print of one for my daughters room. so rad! thanks for sharing! Oh my goodness, I'm obsessed with her work! I want her to draw me! Those sketches are gorgeous! I wish I had that talent! wow! i love these!!! my favorite is the girl in the trench. amazing amazing illustrations! so very adorable! what a great little find...so cool! 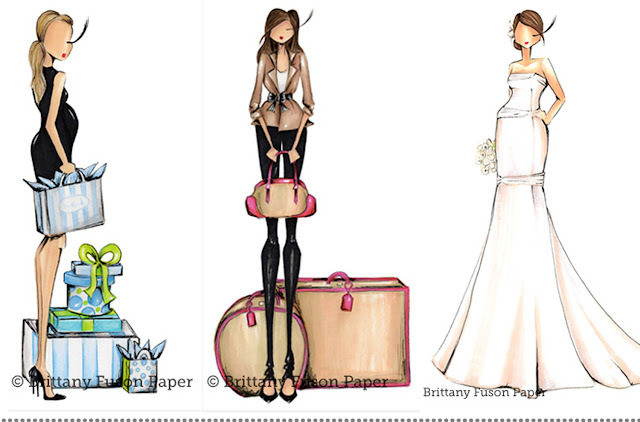 i lOVE LOVE her illustrations! making me kinda jealous..wish i can draw like that! These are so cool! Perfect for a dressing area. Amazing!! Love the eyelash detail! Hello I loved your blog and I'm following, I'm posting my work as a designer of jewelry and accessories, develop a different work creating new textures and geometric shapes, come and meet some pieces posted there on my blog Earring. Roger Rinaldi designer jewelry and accessories. i love these illustrations! a-ma-zing! thanks for sharing! This is so funny - I work with one of Brittany's friends from college, and she was just showing me her site the other day! These are beautiful! I just found your blog, and I am loving reading all of your posts! I love the concept behind this and I adore the way you've set up your site! I'm just starting to play around with html and I'm still struggling, it's like trying to decipher Chinese! Haha!